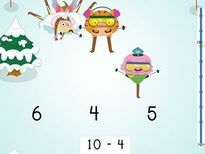 Test your sport star's subtraction skills with some baseball subtraction! Your child will get to solve some simple subtraction problems, which can be a great way to review his addition facts. You can even show him how to subtract by regrouping. 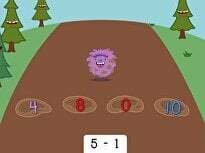 Take a swing at math practice with baseball subtraction! 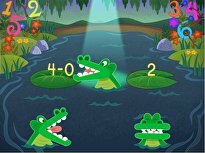 Your child will get to solve some simple one and two-digit subtraction problems. Gobble gobble, get ready for some Thanksgiving subtraction! 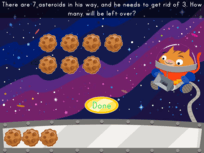 Your child will be on her way to memorizing these simple subtraction facts. Here's a spooky subtraction sheet to celebrate the spirit of Halloween. Your child will solve one and two digit subtraction problems. 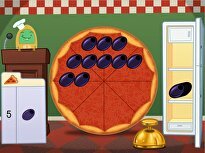 Stay sharp this spring season with a subtraction Easter egg hunt! Your child will practice her subtraction facts, simple one and two digit equations. Kick off the new school season with some subtraction football! Your child will work on simple subtraction facts, and a few problems with regrouping. Help your first grader learn her subtraction facts with this fun math worksheet, filled with bright colors and room for checking her work with tally marks. 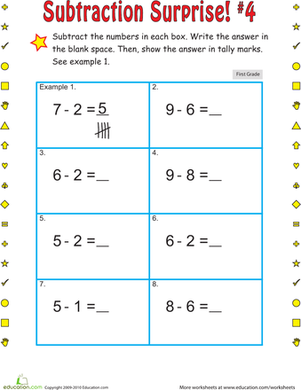 Build basic math skills with this practice sheet, full of simple subtraction equations for your child to practice and start memorizing.